That’s it, turn in your nerd card on the way out! You did read about this in the development threads didn’t you? I don’t know if I have a nerd card. If I did read the development threads, I’ve definitely forgot that bit of information. I forget a lot of stuff. My brain is weird like that. Could you put me on the interest list? 1 click: On (at memorized level). Hold: On (at moon), then ramp up. 2 clicks: On (at ceiling level). 2 clicks, but hold the last click: On (at ceiling level), then ramp down. 3 clicks: First blinky group (battcheck, sunset, adjustable beacon at last-ramped level, tempcheck). 3 clicks, but hold the last click: Second blinky group (adjustable bike flasher, adjustable party strobe, adjustable tactical strobe, lightning storm, adjustable candle flicker). Remembers which was used last. 4 clicks: Soft lockout mode. Doubles as a momentary moon mode. 4 clicks to exit. 5 clicks: Momentary / signalling mode at last-ramped brightness. Disconnect power to exit. 6 clicks: Muggle mode. Disconnect power to exit. People may notice other little differences too… like when turning on the response is faster, but when shutting off the response is slower (it waits to see if you’re doing one click or more than one). If it seems complicated, just remember that basic usage can be described in only eight words: Click for on/off, hold to change brightness. do you (themiller) have any new hard or soft data on what the price will be? also how long will it be? It certainly will not be more expensive than 30 USD. It will also be unlikely that it’ll be cheaper though. So I think the 30 USD are pretty much set. And, paraphrasing The Miller, it will be done when it’s done. I am spoilt by the sideswitch. I can’t abide twisties anymore. The only tailies in my goto’s are the cuTools and only ‘cause of their fantastic patinas. Don’t think I’ll be in for one after all, sorry. i meant length- which i think is 94mm, right? whoa! I am spoilt by the sideswitch. I can’t abide twisties anymore. The only tailies in my goto’s are the cuTools and only ‘cause of their fantastic patinas. Don’t think I’ll be in for one after all, sorry. Oh, was he thinking this light was a twisty? I didn’t really understand what was said. Anyway, this light has a rear mounted e-switch with Narsil ramping firmware. It’s quite unique. Please add me for 1. The ledge at the back end is a functional part of the design, and shouldn’t be a smooth slope. That’s where the fingers catch to provide something to push against when pushing the tail button — cigar-style grip. At the end of the day, this light will be in our hands. And it’s best to accommodate what our hands desire. So I’m a fan of the prototype. If I understand correctly, the button location is probably the single biggest difference between the FW3A and the Emisar D4. Also one of the most sensitive to personal taste. Side switch or rear switch may be enough to determine which one a person chooses. Three-channel driver with regulated modes up to about 3 Amps (instead of 350 mA). Less tint shift and higher efficiency between ~150 lm and ~1500 lm. Clip nicely integrated into the design and included by default. Rounder beam (no pinwheel pattern). More flexible / powerful interface. Button somewhat easier to find in the dark, and easier to press when hot. 4 emitters instead of 3, so higher maximum brightness. Bigger heat sink for higher sustainable output level. Is already possible to acquire. Between the two, I suspect I’ll probably like the FW3A a bit more, but it’s a close call. For me, I think the FW3A’s clip and 3-channel driver and tail switch may outweigh the D4’s higher brightness and bigger variety. Won’t know until I try one though. TK, I’d add that D4 is available with 18350 and 18500 tubes. Good point. I completely forgot about the swappable tube, and added it to the list. However this picture is very distorted – close up with a wide angle lens. I can’t even figure where head and tail are… The light looks ‘fatter’ then what we have previously seen too. I hope we get to see some picts of the samples Lumintop sent a few days ago. That clip is for me unusable, I have to replace it. It is completely rubbish to add a magnet on. Maukka tested another light with the XPG3 LED. Fingers crossed the FW3A does better. 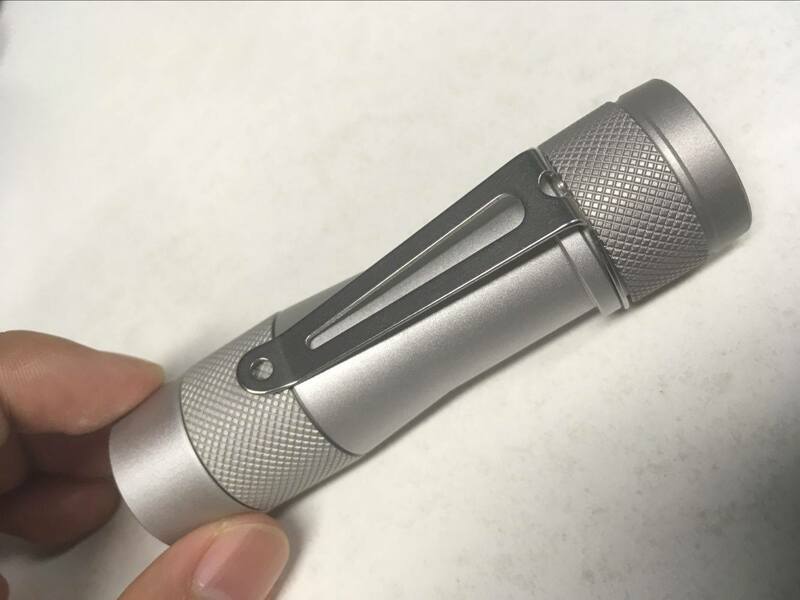 The Olight S1 baton seems like a completely different design and not relatable to the FW3A. Single TIR clear frosted vs triple TIR clear. And it is not Olight’s first light. Frosted optics and another LEDs where suggested right at the begining because of XPG3. But we need first prototypes and then I hope they switch optics and LEDS and do propper beamshoots. The Olight XP-G3 has a frosted TIR.